Pat Schmatz is the author of the critically acclaimed Bluefish. About Lizard Radio, she says, “I keep a notepad with sketches and ideas, and one day a lonely lizard wearing headphones came out of my pencil. The young lizard was desperate to pick up a signal, and from that moment on, so was I. When I tuned in, I found this story.” Pat Schmatz lives in Wisconsin. The themes in Schmatz’s novel surpass in complexity many of its contenders in YA dystopian fiction. The author’s storytelling unravels question upon question for readers, not only about Kavali but also about the power of free will. An entertaining and thought-provoking read, this title will be a big hit for those who want a little something more from their dystopian fiction. Sophisticated, character-driven science fiction, as notable for its genderqueer protagonist as for its intricate, suspenseful plot. Schmatz conjures up sympathetic characters and an intriguing premise...a thoughtful and intriguing look at the teenage search for identity. Schmatz paints a beautiful story with the use of amazingly diverse and well-developed characters. Kivali’s struggle to find where she belongs is highly relatable to a variety of readers, especially those who struggle with their own gender identity as Kivali does...Any person who has trouble fitting in will greatly enjoy this book. 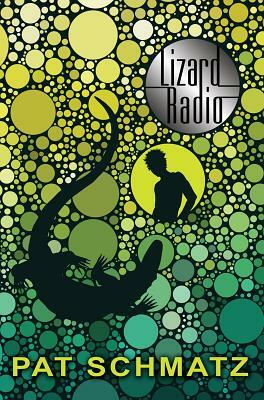 In a sea of post-apocalyptic and dystopian young adult novels with female heroes, Lizard Radio stands out. Unusual, mildly magical, and well paced, Kivali’s quest to dismantle the system manages to be unique yet relatable. The distinct dystopian world, the genderbending protagonist, and the socially conscious writing provoke questions about Kivali’s (and the reader’s) reality. ...there are rewarding revelations rooted in character development. Lizard as a character is endearing from the start, relying on a pretend Saurian identity to push the idea that she doesn’t fit...Sci-fi buffs who love character-driven novels and teens on the GLBTQ spectrum who are looking for a book that isn’t realistic fiction will all find much to appreciate in this clever, edgy novel. This work of science fiction addresses complex issues and deep questions, and would be an outstanding addition for all library collections.